Mona Lisa is a fine dining Spanish restaurant in the South that serves salads, pastas, and pizza. We were given complimentary bread as soon as we were seated. Sicilian Caesar Salad (P 385) and Antipasto Salad (P 385) came in first. Sicilian Caesar Salad was awesome. It has Romaine lettuce, grapes, ripe mango, pine nuts, shaved parmeggiano cheese tossed in homemade Caesar dressing. It was followed by Barbeque Pizza Pollo (P 430). The barbequed chicken strips is given more pronounced flavor with a generous topping of mozzarella cheese. Each bite guarantees a mouthful of chicken barbeque! Next we had Monalisa Speciale and Miguelli Calabrese Panizze. Panizze are thin crust pizzas that are best eaten rolleed. And I love that the Miguelli Calabrese has mozzarella and parmesan cheese, homemade Italian sausage, porcini mushroom, herbs plus cream sauce. 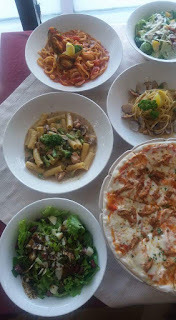 For pasta, we tried Pollo Pizzimente (P 535), Spaghetti alle Vongole (P 450), and Fettuccine Pescatore (P 550). 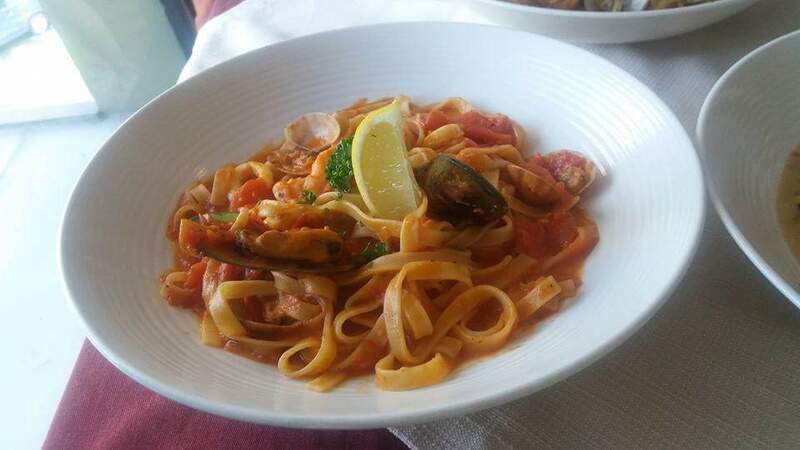 Fettuccine Pescatore is pasta loaded with mixed seafoods. It has mussels, squid and shrimps. Spaghetti alle Vongole is oil-based spaghetti mixed in with clams. I prefer Pollo Pizzimente, which is creamy pasta. 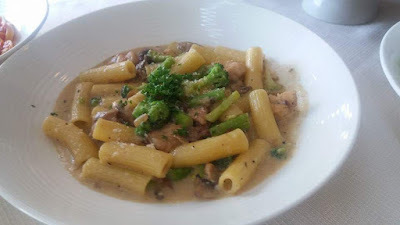 It has chicken meat, bits of broccoli, asparagus, and a touch of earthiness brought in by the sliced porcini mushrooms. Mona Lisa's food choices are delicious. Check them out soon.